The National Safety Day/Week Campaign is celebrated in India every year (organized by the National Safety Council) to commemorate the establishment of this event, 4th of March as well as enhance the safety awareness among people. National Safety Council of India is a self-governing body (non profit and nongovernmental organization for public service) which was established on 4th of March in 1966 under the Societies Act in Mumbai, having over 8000 members. It is a national movement carried out on annual basis to prevent and lessen the loss of life including various human being problems and their financial loss through availing them with safety, health and environment related support services. It is celebrated with great enthusiasm to make aware the people about how to get prevented from the industrial accidents by exhibiting widespread safety awareness programs in the public sectors which have not been covered by any safety legislation. During whole week campaign celebration, varieties of specific activities are displayed to the people as per the safety requirements. National Safety Day/Week is a whole week safety campaign which was celebrated from 4th of March (Monday) to the 10th of March (Sunday) in 2019. The National Safety Day Theme 2019 was – “Cultivate and Sustain a Safety Culture for Building Nation”. The 48th National Safety Day/Week was celebrated across the nation by industries, trade unions, regulatory agencies and NGOs. A series of campaigns were conducted across the country to increase safety awareness and reducing accidents. The campaign majorly aimed at promoting safety at workplace and outside workplace. Various public and private industries in the country observed the day by demonstrating various safety techniques like fire extinguishers usage, electrical safety, emergency management and use of safety equipments during work. Poster and painting competitions for children were also organised to mark the day. > For the convenience of the campaign organizing organizational members. > For making sure about the quality materials which should reflect the national SHE issues. > For generating support to the organizations in order to contribute to the economic self-reliance of the National Safety Council. In order to organize this campaign, a national level and safe governmental support is given to the members. The campaign is well planned to make it highly visible among the people through the efficient use of an electronic media journals, newspapers and other industrial magazines. Following national level activities for whole week such as variety of public functions including seminars, debates, poster of safety messages and slogans distribution, essay competitions, safety awards distribution, banner exhibition, play of drama and songs, training programs, workshops, display of films over SHE issues are held during the campaign celebration. Safety Pledge event is carried out by the organizational employees. Safety activities based training programs are held for the industrial staffs over various topics to carry out their responsibilities very well. During training session they are taught about the testing and examination of pressure vessels, lifting machines, chemical and electrical safety, risk handling and assessment, fire control, first aid knowledge and etc. > National Safety Day/Week is celebrated on national level all over the country to aware people about safety including the various health and environmental movements. > It is celebrated to get the goal of great level of the public participation to play the major safety roles in different industrial sectors. > Through the campaign celebration it is largely promoted the utilization of participative approach by the owners of the company by promoting their staffs in the safety, health and environmental activities. > Through this campaign, the need-based activities, self-observance with legal requisites and professional SHE (safety, health and environmental) activities are encouraged among staffs at the work places. > Work place safety is promoted to a great level by reminding the employers and employees including other staffs of their legal responsibilities. > To get the goal of developing and strengthening the SHE activities among people to the workplaces. > Serve the society with preventive culture and scientific state of mind by organizing a safety approach. 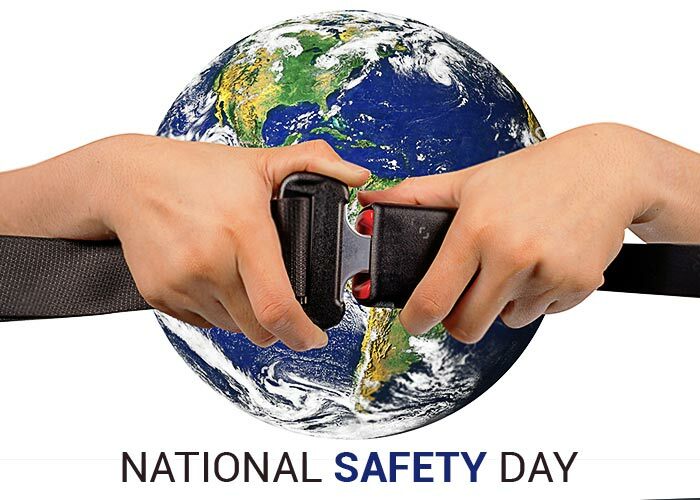 > National Safety Day/Week theme of 2019 is – “Cultivate and Sustain a safety culture for building nation”. > National Safety Day/Week theme of 2018 was “Reinforce Positive Behavior at the Workplace to achieve Safety and Health goals”. > National Safety Day/week theme of 2017 was “Keep Each Other Safe”. > National Safety Day/week theme of 2016 was “Strengthen Safety Movement to Achieve Zero Harm”. > National Safety Day/week theme of 2015 was “Build a Safety Culture for Sustainable Supply Chain”. > National Safety Day/week theme of 2014 was “Manage stress at Workplace and Control Hazards” and “Safety: It Takes All of Us”. > National Safety Day/week theme of 2013 was “Working Together to Ensure Safe and Healthy Workplace”. > National Safety Day/week theme of 2012 was “Ensure safe and healthy working environment – A fundamental human right”. > National Safety Day/week theme of 2011 was “Establish and maintain preventative safety and health culture”.